A different kind of back support. Encourages an open and active sitting posture. 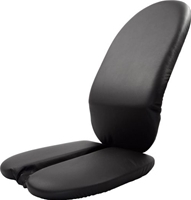 Open channel in seat relieves genital & coccyx pressures. Portable for use in cars, planes, trains and theaters.